The video below demonstrates how the 5-2-1 Compressor Saver® (aka Hard Start Kit) works conceptually. The video is a non-technical representation on how the 5-2-1 Compressor Saver® works and helps protect your air conditioner so you can save you money, prolong the life of the air conditioner and reduce air conditioning repairs. The video below shows how simple, easy and non-intrusive installing the 5-2-1 Compressor Saver® is when done by a licensed air conditioning technician. In the video, the head of our training department - Andy Potter - walks us through an actual customer installation and answers commonly asked questions about the 5-2-1 Compressor Saver®. The video was created for home owners, so it does not get too technical. 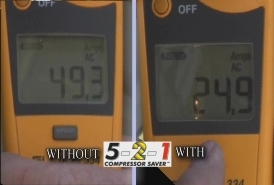 We hope you find the video educational and hope that you see for yourself exactly how much faster the air conditioner starts and how much less power the air conditioner uses during start up with the 5-2-1 Compressor Saver®. 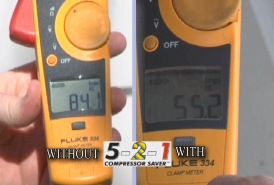 Watch the video to understand what this result means and how beneficial this is for your air conditioner. The video below is intended for a technical audience, specifically licensed air conditioning technicians. The purpose of this video is to train a technician on how to properly install a 5-2-1 Compressor Saver®. The video will first walk through the installation via a schematic and then actually walk through an actual installation on a condensing unit. The installation portion of the 5-2-1 Compressor Saver® Technical Video identifies several important installation tips including how to easily identify the run side of the contactor and run capacitor. In addition to demonstrating the "before and after" in-rush measurements, we also demonstrate an important test to verify that the start components are working properly. Watch the video to learn how to conduct this test and understand why it is valuable product demonstration.